With Halloween only a few days away we turn our thoughts to…The Colon Cemetery! Few places can boast a cemetery as a bona fide tourist attraction but the Lakeside Cemetery in Colon is fast becoming just that. 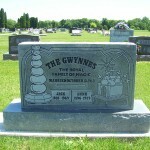 It is the final resting place for over 20 magicians of note and its population (and popularity) is growing. During the last magic week, Rick Fisher of Fab Magic presided over “broken wand” ceremonies for Marilyn Abbott (Daughter of Percy, but not buried in Colon) and Roy Huston (Who’s ashes will be split between his Florida resting place and Colon). 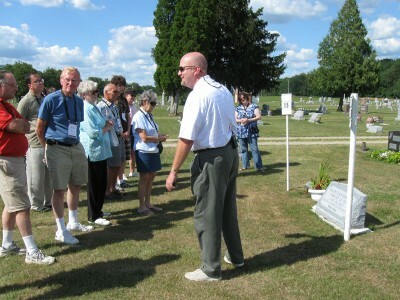 Rick also presided over long time Colon Magician Jack Barrows Broken Wand ceremony in 2007. Several years back the Graveyard Tour became an official part of the Abbott Get Together during magic week with Magician Al the Only conducting the tour. 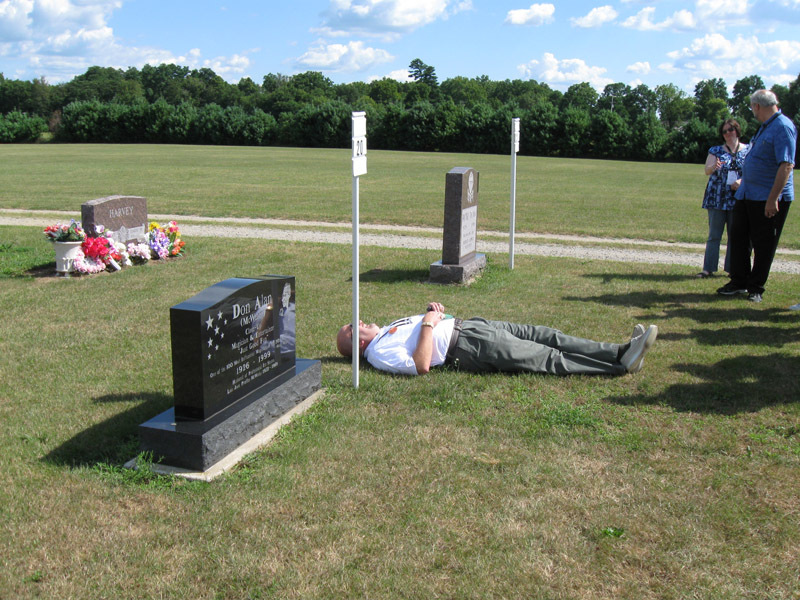 Al and his wife already have a plot at the Cemetery and during the tour Al poses in his “everlasting pose” for Magics Final Act. 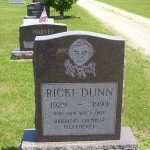 Al’s plot is between Don Alan and Ricki Dunn, although the marker is not up at this time. The tour is very popular and often you will find headline magicians attending such as Marshall Brodien, George Schindler, and Bruce Kalver. here. The Magician who took karrell on the tour is unknown at this time. 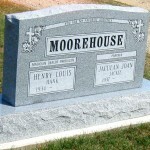 This year a new tombstone was added to Magic’s Final Act, that of Hank and Jackie Moorehouse. 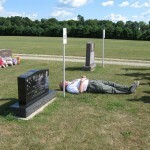 Hank has been involved with the Get Together for decades so it was a little unsettling for some to see his tombstone during the tour, considering he was hosting the dealers on parade event that moment at the Elementary School. 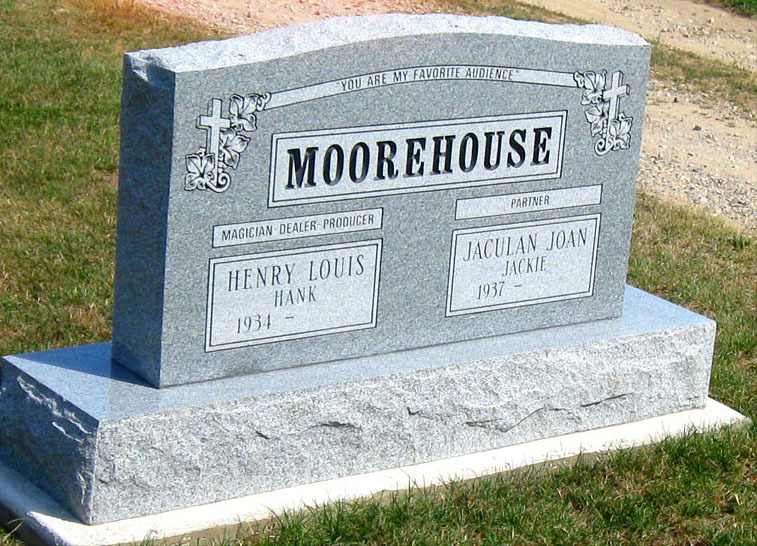 Hank and Jackie are both very much alive, but have selected the Colon Cemetery as their final resting place and wanted to have their headstone made up in advance. If you are planning on visiting the Lakeside Cemetery in Colon, below are some of the tombstones you will find at Magic’s Final Act. 1. 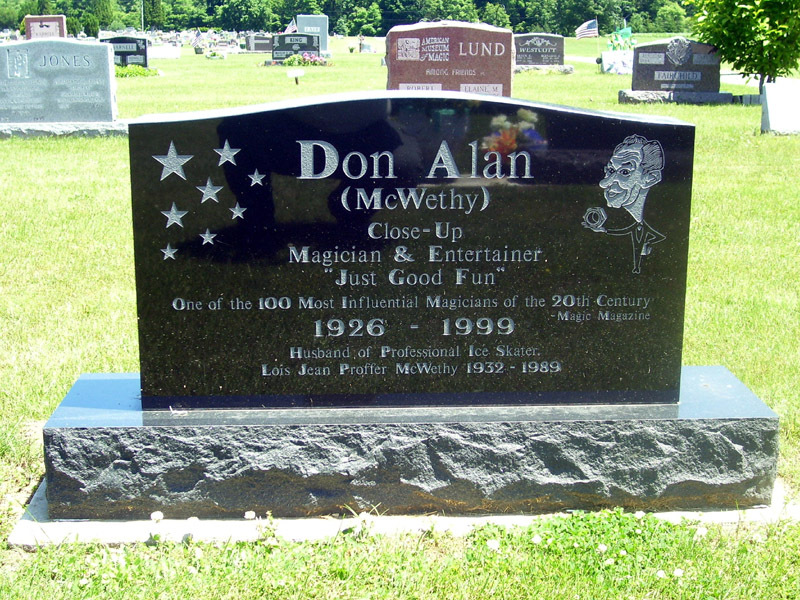 Alan, Don (McWethy) (1926-1999) and Lois Jean (Proffer) (1932-1989). 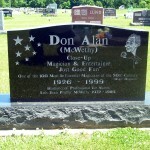 Don was a Magician and Entertainer. 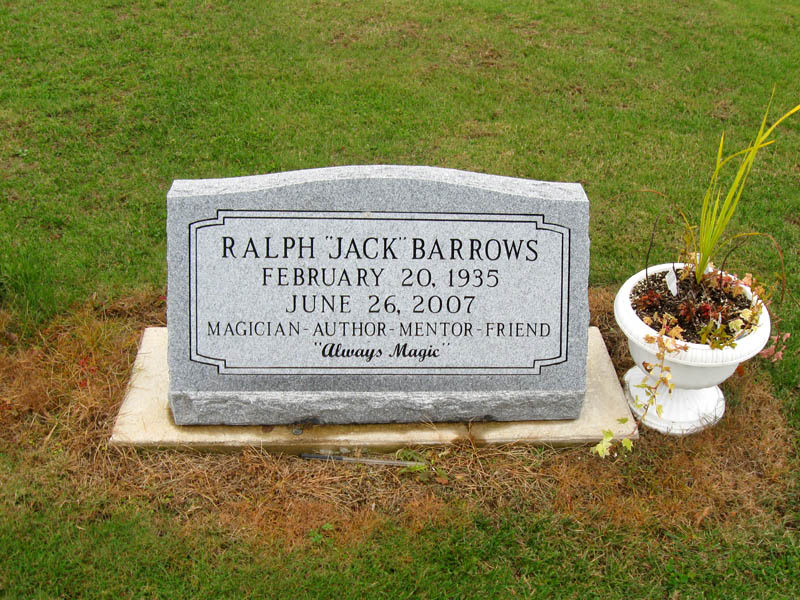 Named one of the 100 most influential magicians of the 20th century by Magic Magazine. Lois was a professional ice skater. 2. Babbs, Arthur G (1921-1987) and Patricia (1934-). Arthurs stage name was “Arturo”. He had a shop in Ohio where he designed tricks and received patents on many. In later years he worked at Abbotts Magic, building and designing tricks. 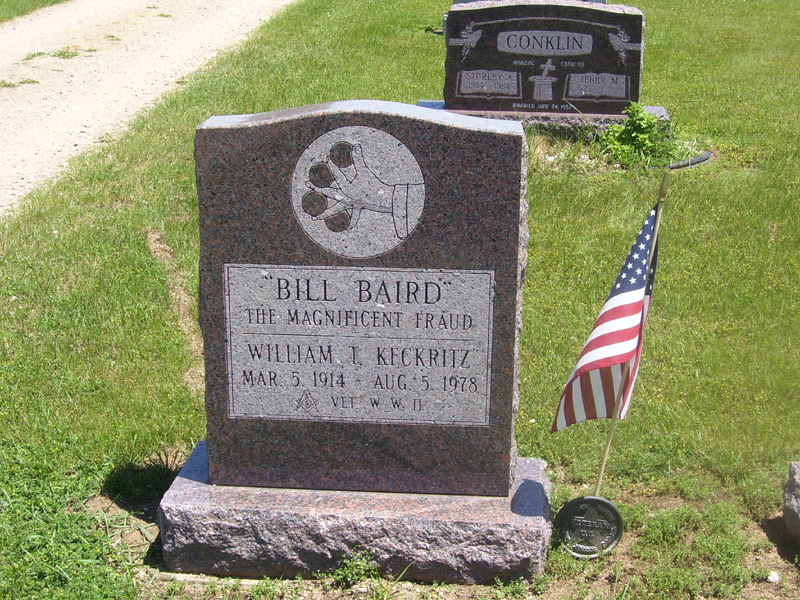 His stage name was “The Magnificent Fraud”. Known for multiplying balls dexterity. 4. 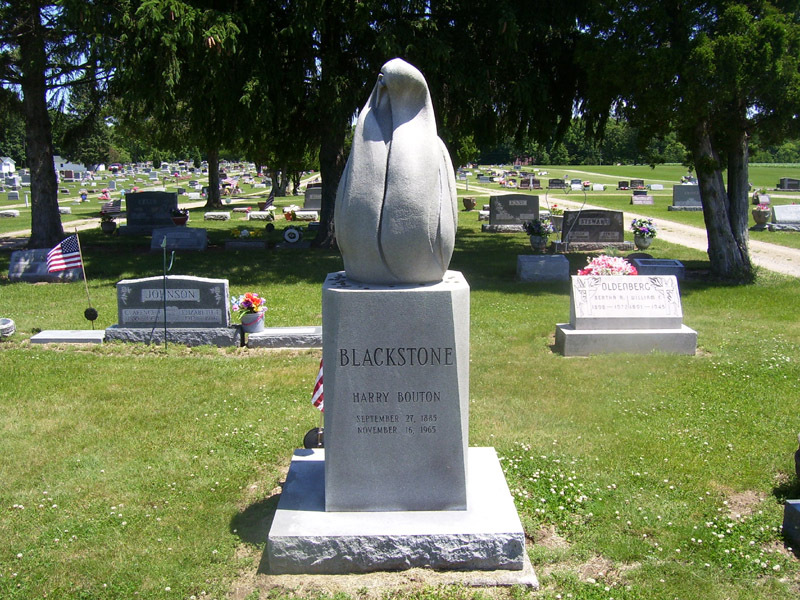 Blackstone, Harry Jr (1934-1997). Harry followed in his father’s footsteps in becoming a magician of considerable renown. 4a. Also buried here is Harry Blackstone III. 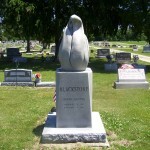 For Harry Blackstone Sr. see Bouton, Harry. 5. Booth, John Nicholls (1912-) and Edith Kriger (1907-1982). 6. Bordner, Recil (1910-1981) and Donna (1912-1974). Owned and managed Abbott Magic Company. Originally teamed with Percy Abbott. 7. Bouton, Peter (1887-1968) and Mildred (1902-1979). Peter was the look-alike brother of Harry (very useful in magic). Who changed his name to Harry Blackstone. He became a well-known magician and brought Magic to Colon in 1926. For a time he was teamed up with Percy Abbott in the manufacturing and selling of magic tricks. 9. Conklin, Jerry (1928-) and Shirley (1934-1987). They were the “Amazing Conklins” of magic. Jerry is still active in the Colon community. 10. Coppin, Ted (1886-1942) and Della (1909-1977). Their stage names were “Ted and Sally Banks”. Ted, Stan Laurel & Charlie Chaplin had a vaudeville act together. Ted was later the stage manager for Harry Blackstone Sr. Della was also part of the show. 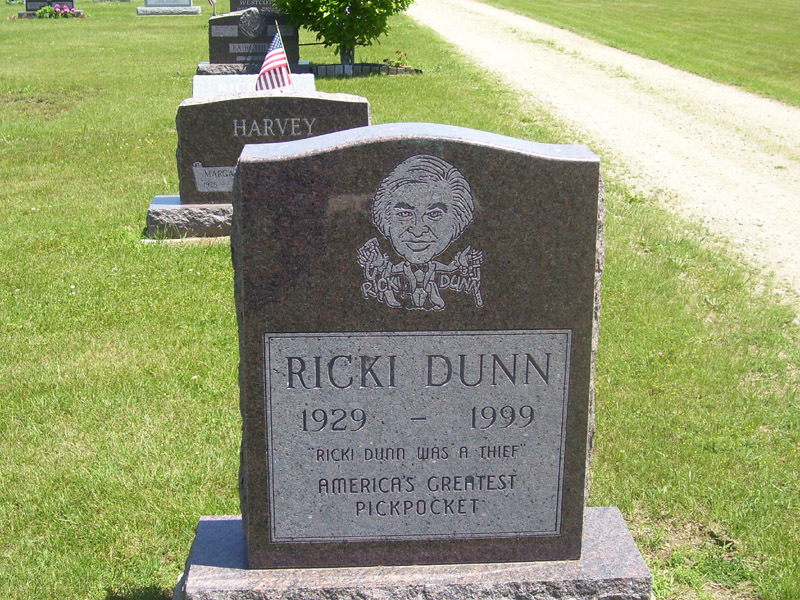 Was a comedian and was promoted as a thief and known as “America’s Greatest Pickpocket”. Was involved with magic, balloons and puppets. His stage name was “Holiday”. His epitaph reads “It Was Fun”. Was an integral part of the Magic Get-Together of Abbott’s Magic. 14. 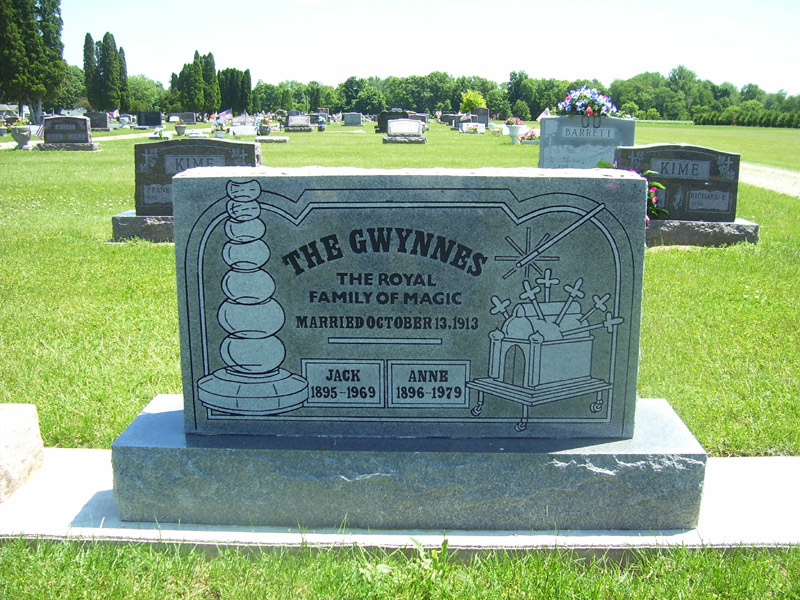 Gwynne, Jack (1895-1969) and Anne (1896-1979). “The Royal Family of Magic”. Jack invented the “Temple of Benares”. He was famous for the appearing stack of bowls! 15. Jones, “Little Johnny” (1899-1997) and Catherine (1899-1997). Married 75 years, he was the “Conjuring Humorist”. His epitah read: “Now I have to go and fool St. Peter.” He worked with the USO in WW2 and was a WWI Veteran. 16. Kitchen, Inez Blackstone (1889-1983). She, with Harry Blackstone Sr. brought magic to the village of Colon. She is not actually buried in Colon which is why her headstone reads “in memory of”. 17. Lamore, Skippy (1893-1942) and Jean (1888-1962). 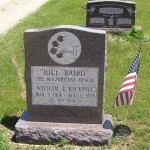 He worked with vaudeville tent shows. 18. 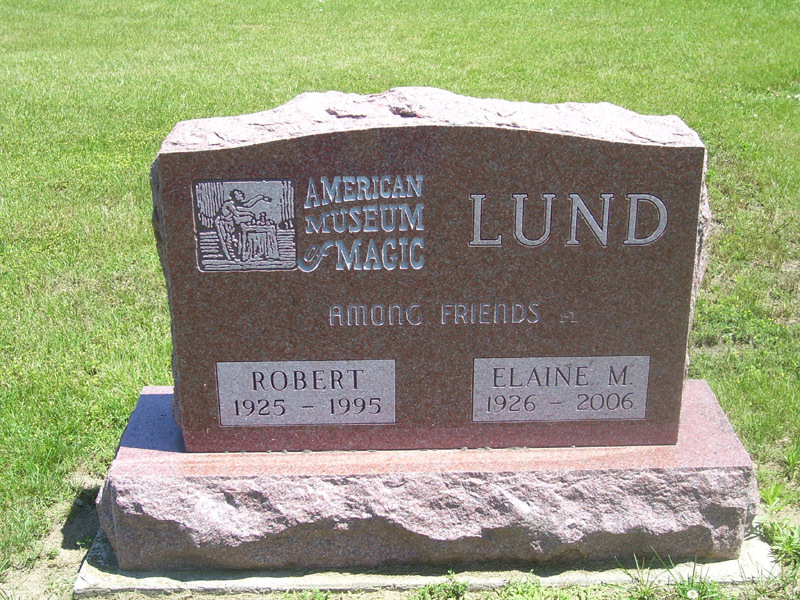 Lund, Robert (1925-1995) and Elaine (1926-2006). 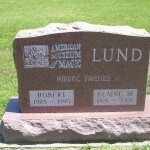 He and his wife owned/operated the American Museum of Magic in Marshall Michigan. 19. Merrill, Fred R (1888-1976) and Caroline E. (1900-1991). He was a juggler and magician. Magician, Musician, and Circus Drummer. He was famous for comedy magic. He worked for many years with Karrell Fox on the Magic Get-Together in Colon. Originally was married to Barbara Maurer, A Colon girl. 22. Straw, Marx Edward (1935-2005). Sleight of hand expert. Marx was a prodigy of Percy Abbott of Abbott Magic. 23. Thornton, Jesse (1901-1943), Velma Wagner (1917-1987). A magician and inventor of some of today’s magic classics. He was employed at Abbott’s for many years. 24. Watson, Donald (Monk) (1894-1981) and Mary. Humorist, magician and band-leader who once was teamed with a man named Benjamin Kubelsky (later called himself Jack Benny) in Vaudeville. Monk was very active with the USO in WW2 and was a WWI veteran. 25. 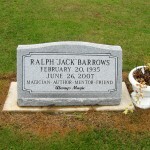 Barrows, Ralph (Jack) (1935-2007). Graves currently are $500.00 for persons living outside of Colon Township. This entry was posted in General Info, Magic News. Bookmark the permalink.